Cardiomyopathies are a group of diseases that primarily affect the heart muscle. The main types of cardiomyopathy include hypertrophic, restrictive and dilated cardiomyopathy. Dilated cardiomyopathy, a condition in which the heart becomes enlarged and cannot pump blood efficiently, is the most common type. The decreased heart function can affect the lungs, liver, and other body systems., Cardiomyopathy makes it harder for your heart to pump and deliver blood to the rest of your body, and can lead to heart failure. The current American Heart Association definition divides cardiomyopathies into primary, which affect the heart alone, and secondary, which are the result of illness affecting other parts of the body. These categories are further broken down into subgroups that incorporate new genetic and molecular biology knowledge. Symptoms may include shortness of breath after physical exertion, fatigue, and swelling of the feet, legs, or abdomen. Additionally, arrhythmias and chest painmay be present. 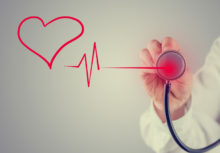 These diseases are diagnosed using a variety of measures, including physical exams, review of family history, blood tests, EKGs, echocardiograms, stress tests and genetic testing. Treatment may include suggestion of lifestyle changes to better manage the condition. Treatment depends on the type of cardiomyopathy and condition of disease, but may include medication (conservative treatment) or iatrogenic/implanted pacemakers for slow heart rates, defibrillators for those prone to fatal heart rhythms, ventricular assist devices (VADs) for severe heart failure, or ablation for recurring dysrhythmias that cannot be eliminated by medication or mechanical cardioversion. The goal of treatment is often symptom relief, and some patients may eventually require a heart transplant. Other diseases that cause heart muscle dysfunction include coronary artery disease, hypertension, or abnormalities of the heart valves. You may know cardiomyopathy as a type of heart disease, but it’s actually more than that. 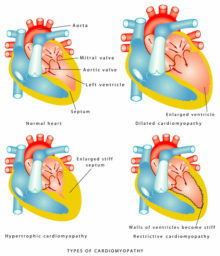 Cardiomyopathy is really a group of diseases affecting the heart muscle. There are several kinds of cardiomyopathies, and each one has its own set of possible causes and outcomes. Q: I’ve seen ads for mail-order test kits that provide genetic testing for cardiovascular disease. Is there any benefit to having this type of testing? Q. I read about genetic testing in all fields of medicine. But I don’t fully understand the concept. I was hoping you could explain how genetic testing relates to heart disease.